If you want your pavers to look their best, just call Ohio Power Washing and we’ll do the rest! Paver Patio Stones are very hard and durable, they are also extremely porous. This makes them very vulnerable to oil stains, spills, and moisture related problems such as efflorescence. The sand between and below the pavers is also a weak point. It can easily wash away with heavy rain and will also quickly start to grow weeds soon after construction. Both can cause serious structural problems for your pavers. Sealing your pavers can address all these issues, as well as enhance and restore the colors to your pavers. We have sealers that leave a completely natural appearance, and paver sealers that beautifully enhance the colors and leave a rich wet look. Sealing not only protects the paver itself, but also the sand between the pavers. As the sealer soaks deep into the sand joint, it hardens and locks the sand into a solid mass that cannot wash away or grow weeds. Aesthetically, there is no question that a properly sealed brick paver surface looks better than its unsealed counterpart. 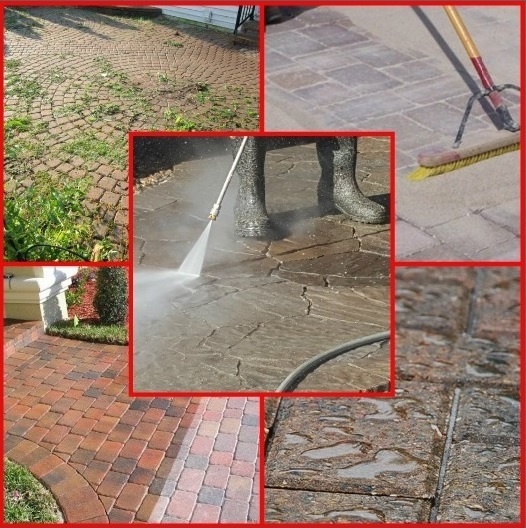 Call Ohio Power Washing of Central Ohio for all your paver and stone cleaning and sealing services. Click Here to find out more about our Paver Clean+Protect Services!